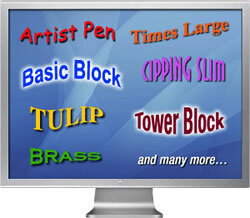 Embroidery Fonts Plus (EFP) is the only FREE EMBROIDERY LETTERING SOFTWARE for the commercial and home embroiderer. It comes with 3 FREE FONTS and includes features to adjust the fonts to fit all your embroidery needs. Free online training on how to use the free efp lettering software for all your embroidery projects. all you need is a broadband connection and login into one of the scheduled training classes up to 5 minutes before the class starts! Happy with the FREE Embroidery Lettering Software? With the huge selection of unique fonts that we offer, we're confident that you will be able to find a font for all your projects. Simply search our catalog of EFP FONTS and immediately download the font to start your project!